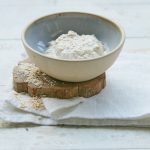 While it’s hard to enjoy the burning feeling that builds up in our legs during exercise, at the Wellbeing studios we’ve come to love lactic acid for bringing us some of our favourite foodie treats, from sourdough bread to gut-friendly kefir. Even outside of the kitchen, lactic acid is increasingly cropping up on beauty counters, boasting a broad repertoire of skin benefits that can sound too good (and varied!) to be true. Read on to discover why we think this multitasking acid deserves a place in your skincare regime, how and when to use it safely, as well as our beauty-boosting recommendations for every budget. A member of the alpha-hydroxy acid (AHA) family, this water soluble, chemical exfoliant encourages the skin’s natural renewal process by helping to dissolve the bonds between the outermost layer of skin cells (the stratum corneum). This process makes way for fresh and more youthful-looking skin cells underneath, leaving behind a smooth and radiant complexion. This is no cause for panic: far from an aggressive chemical peel, this shedding of skin cells is invisible to the naked eye. In fact, chemical/acid exfoliants are often less damaging to the skin than more crude physical scrubs and, in the right concentration, are a good option for sensitive skin. By encouraging a faster cell turnover, lactic acid can help to fade areas of discolouration and pigmentation on the skin’s surface. It’s a great option for treating stubborn dark spots that linger long after a blemish has disappeared, as well as sun and/or age spots. In fact, clinical studies have shown that lactic acid might also protect against areas of pigmentation forming in the first place. This is because it has been proven to inhibit the activity of a protein called tyrosinase, involved in the production melanin. In contrast to it’s much more commonly used cousin – glycolic acid – lactic acid is an excellent humectant. This means that, in addition to slewing away dead skin cells, lactic acid draws water into the skin, forms chemical bonds with these molecules and improves the skin’s overall hydration. Lactic acid can also help us reap the full benefits of our other skincare products. Once this gentle AHA has broken down the bonds between dead skin cells in the stratum corneum, other active ingredients are better able to penetrate the skin’s surface. Introducing acidic products, such as lactic acid, into our skincare regime can also help to maintain the acidic pH necessary for the healthy function of our skin’s good bacteria. The skin biome is important as it helps the skin fight off disease-causing bad bacteria such as the acne forming P.acnes. It also helps to fortify the skin’s barrier function, protecting the skin from environmental threats such as pollution and sun damage. Who can use lactic acid? While most will benefit from introducing lactic acid into their skincare regime, this gentle AHA’s ability to exfoliate and hydrate makes it a true match-made-in-heaven for those with dry and dull skin. It’s also the perfect helping hand for mature skin as the skin’s natural cell renewal process begins to slow as we age. With a molecule size larger than other AHAs, it is also worth noting that lactic acid is generally better tolerated, even on more sensitive skin. Unlike some other actives such as vitamin A derivative – retinoic acid, it is also considered safe for use during pregnancy and breastfeeding. How to use lactic acid? Our skin’s surface provides essential protection against damaging UV rays, pollution and other environmental challenges so, while lactic acid offers a multitude of beauty benefits when used correctly, it’s important to not be too gung-ho with chemical exfoliation. Lactic acid can be used daily or as a one-off treatment depending on its strength. You can determine the strength of a product by checking it’s lactic acid concentration and pH: the lower the pH and higher the concentration, the more potent the exfoliant. For beginners, we recommend leaving stronger chemical peels to a qualified facialist and choosing products with a lactic acid content of no more than 10%. As with any active ingredient, introduce lactic acid into your routine gradually, beginning with 1-3 times a week depending on your skin’s sensitivity. Be sure to patch test the product before first use; while a gentle tingling is to be expected, lactic acid should not burn the skin. Always follow up with a broad spectrum, mineral sunscreen during the day. Reportedly a favourite of Helen Mirren and Stella McCartney, Sunday Riley’s Good Genes (£85.00) is a lactic acid treatment like no other. Do not be fooled by this product’s relatively low lactic acid concentration (5%), with a pH of 2.6 this serum packs a potent exfoliating punch that isn’t suitable for more sensitive skins. Best applied overnight, this luxurious treatment is full of other skin-goodies including radiance-boosting liquorice, circulation-enhancing lemongrass and soothing arnica. Kate Sommerville’s ExfoliKate Glow moisturiser (£55.00) combines an alpha-hydroxy duo of lactic and glycolic acid alongside Kate’s ‘three Ps for perfect skin” (pineapple, pumpkin and papaya enzymes). An exfoliating all-rounder, this is the perfect option for those looking for a youthful glow. We’ve found that this moisturiser works a treat under makeup as it works away the areas of texture and dry skin that face products tend to cling to. A more traditional lactic acid toner, we love the Ready Steady Glow Daily AHA Tonic (£25.00) from REN. Developed for daily use, this gentle formula contains approximately 4.5% lactic acid and has a pH of 3.5-4. This is a great introductory product for the uninitiated. At the Wellbeing studios we believe that great skincare need not be reserved for the face alone. Another knockout lactic acid formula from REN, we’ve been loving their equally fabulous AHA Smart Renewal Body Serum (£35.00). Designed for flaky, dry and mature skin types, this slightly stronger exfoliating serum (10% lactic acid) restores a natural glow to lacklustre limbs. It has a lightweight formula that sinks in effortlessly and is excellent for treating Keratosis pilaris (chicken skin) as well as scaly elbows and knees. For those looking to try lactic acid without breaking the bank, we love this no-frills lactic acid serum from The Ordinary (£5.50). With a pH of 3.8 and available in both a 5 and 10% concentration, this lightweight orange serum also contains hyaluronic acid for an added hydrating boost.